With the loose goal of exploring the Ancient Center of Rome with its Colosseum, Forum, Palatine Hill, and its Capitoline Museums, I set out. 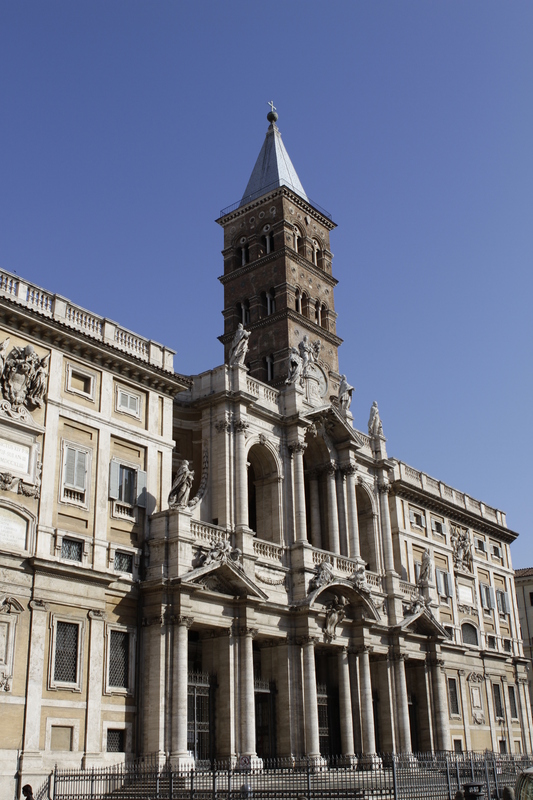 First, I paused a block from my convent, to marvel at the Basilica of Santa Maria Maggiore (AD 352) with its Baroque façade and the highest bell tower in Rome. This church served as the perfect landmark from which to mark my way. From here, with the trusty map in my Fodor’s guidebook, I headed down Via Merulana, a surprisingly peaceful avenue, partly lined with trees. After finding a tabacchi and waiting for a lady and her little dog to finish their purchase, I bought a €4 bus and metro pass, good for 24hr. (Vorrei una carta di autobus, per favore. My imperfect Italian was enough for the lady to grasp that I wanted to buy a bus ticket. Per una volta o per un giorno? she asked. Per un giorno. Not a one-time ticket, but a 24hr pass or, literally, “for a day.” Grazie. Buona giornata. Thank you. Have a nice day. What fun it is to learn this language! How I want to know it well!) 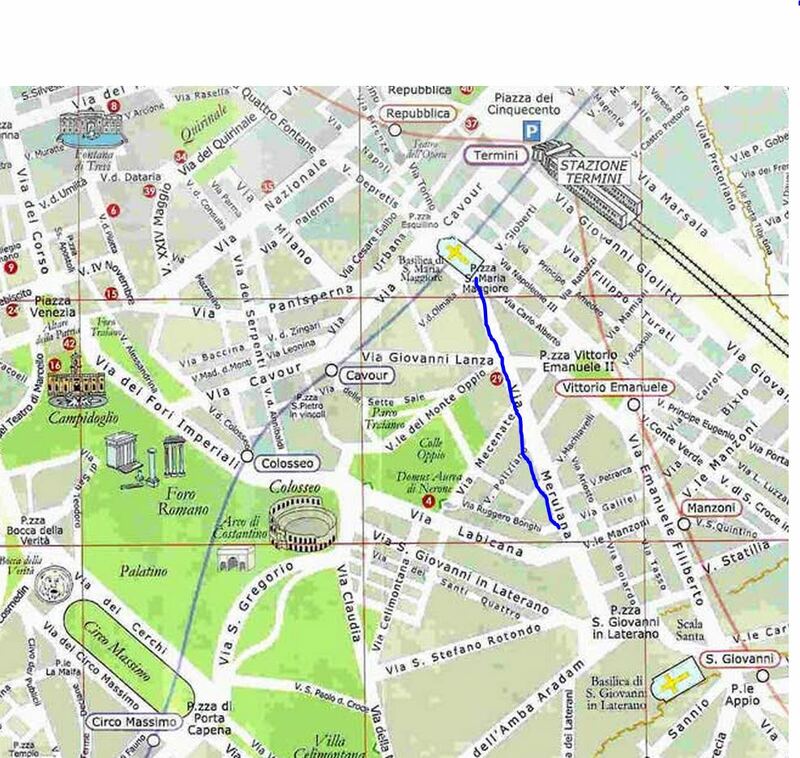 I had previously learned Rome’s pretty straightforward metro system but not the seemingly more formidable and complicated bus system, so I was determined to step out of my comfort zone and onto a bus today. Although I’d had two cups of the excellent coffee and hot milk at my convent, I couldn’t resist a leisurely cappuccino at an outside table at Il Pasticciaccio Lounge Café. The weather was just too fine and the people-watching too irresistible. And, besides, I was determined not to harbor a sense of urgency even though I had only this one full day in Rome. For a wonderful primer on ordering coffee in Italy, which should be read by any coffee drinker headed to Italia, please head to my friend Diana Corridori’s post here. This entry was posted in Italy 2012 and tagged Baroque, Basilica of Santa Maria Maggiore, caffe latte, cappuccino, espresso, Il Pasticciaccio Lounge Café, Italia, Italian, Italy, latte, Roma, Rome, Santa Maria Maggiore, tabacchi, Via Merulana. Bookmark the permalink.